If it is our goal to see an increase in student levels of engagement, an improvement in student performance standards and learners skilled, then we have to rethink what our instruction. 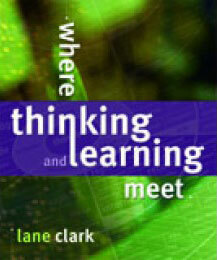 In Where Thinking and Learning Meet, Lane Clark challenges our individual and systemic educational beliefs and practices. She offers an approach to rethinking and re-engineering how teachers teach and how learners learn. This book includes a CD that contains an entire inquiry at both a primary and secondary level. A ‘step by step’ implementation guide has been provided with hyperlinks to more than one hundred files that include,organisers, criteria, planners and learning process models for student use.